A residential lease agreement is a legally binding agreement negotiated between landlord and tenant, when the potential tenant is considering renting residential property from a landlord or via an agency. 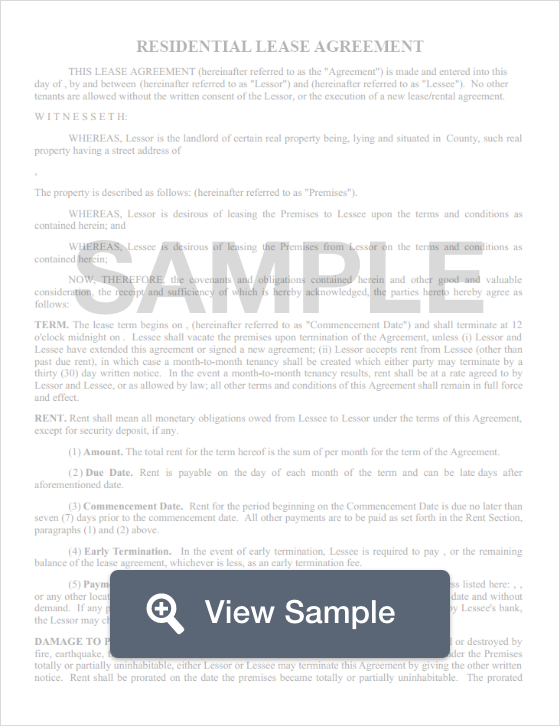 Create a free Residential Lease Agreement in minutes with our professional document builder. A Residential Lease is a legally binding agreement negotiated between landlord and tenant, when the potential tenant is considering renting residential property from a landlord or via an agency. The Lease includes address of the property, tenant and landlord contact details, an inventory of fixtures and fittings, terms of the lease. Anyone becoming involved in a contract related to rental of residential space needs a valid contract to outline the rights and responsibilities of both parties, i.e. the landlord or a tenant. Some residential rental contracts include terms offering a rent-to-buy or rent-to-own arrangement, whereby the tenant has an option to eventually buy the property they lease. This option to purchase offers some tenants the option to buy a home within a specified period of time and / or for a certain price. This form of residential lease agreement is used when a landlord wants to sell a home, but, the prospective tenant does not have sufficient deposit to afford a mortgage, or they have a negative credit rating, so cannot secure mortgage lending provision. Right to buy tenant(s) can choose to pay a non-refundable fee to their landlord in return for the right to purchase their home at a pre-determined, fixed price. If such a tenant decides not to purchase their right-to-own property, the landlord keeps the 'option fee'; this is tantamount to a non-refundable deposit. What if a Residential Lease Agreement differs from the law? A Residential lease agreement is a legally binding tenancy agreement a Landlord and tenant of a residential space. It outlines the rights and responsibilities of both the Landlord and Tenant during the tenancy and cannot take away legal tenancy rights. What protections does a residential lease agreement offer? There are laws which protect both tenants and landlords; the tenancy agreement sits within this framework, so where the arrangement does not comply with the law, the law takes precedent. The terms and conditions of any specific lease make clear the rights and responsibilities of each party, so that where breaches occur, either side may cite terms and conditions which refer to that given situation. Where there are gaps in an agreement, the law must be referred to. What happens when the landlord changes terms of a periodic tenancy? The landlord cannot justifiably change the terms of a residential lease during any specified lease period. If the landlord wants to change the terms for a forthcoming period, the tenant may either accept these changes and continue to live at the premises, but on the new terms, or opt to give statutory notice to terminate the lease. Here is our guide to determining whether or not you are ready to buy a home. We cover the pros and cons of home ownership, how to assess what you can afford, and when is the right time to take the plunge of home ownership. We hope this guide helps you figure out whether or not now is the right time for you to become a homeowner. How long do you plan on staying in your current town? In general, buying a house represents a long-term commitment to a geographic area. If you plan, therefore, on leaving the area in the near future, perhaps now is not the right time to purchase a home. What is the nature of the housing market in your area? How have home values in your area performed over the last 3-5 years? Have they appreciated consistently? If so, buying may very well be a good investment. You should also read up on economists’ projections for housing prices in the immediate future. If, for example, experts predict a decline or bubble, you may want to wait out the downturn before purchasing. How much money do you spend in rent? How much would you spend on a mortgage for a comparable domicile? Assuming you can afford the difference, you should consider buying. Rent payments are gone forever. Mortgage payments, on the other hand, contribute to your purchase of the home (i.e. the amount of each payment that goes to the loan principle rather than interest) and disappear after you pay off the loan (typically 30 years) or can be recouped if you sell. How much will taxes cost, or save you? Recent changes to tax law have left some of this in limbo. That said, while homeowners, unlike renters, are obligated to pay annual property taxes (typically around 1% of the assessed value) they also are able to deduct money pertaining to taxes and interest paid on their mortgage in order to lower their tax bill. You should therefore figure out how much you will have to pay in property taxes if you buy and how much you will save in taxes each April. Calculate the monthly tax saving (annual savings divided by twelve) of owning a home. Subtract the benefits from the cost of ownership (this is referred to as after tax cost). Compare that cost to the market rent for a similar property. It is likely that owning will cost more than renting, but remember, you will never see rent money again. Monthly mortgage payments, on the other hand, are contributions to an investment that likely represents your most valuable asset. Therefore, calculate the price to rent ratio. As a general rule, if the ratio is less than 20% it makes more sense to buy. Even if you decide that the cost of ownership is too high at this point, tabulating the specific costs will give you a better idea of when the timing will be right for you. By working this out you will know when buying makes more sense than renting (called the breakeven horizon). Cost of living: People have different beliefs on how much of their gross monthly income an individual should spend on cost of living. For many, the number is around ⅓ (especially in expensive areas like the San Francisco Bay Area), but for others the amount is less. You can continue to save for retirement, emergencies, etc. You have enough in savings to cover your mortgage and expenses for 3-6 months, even if you lose your job. You are able to maintain your lifestyle (entertainment, vacations, dining out, etc. ), or are at least comfortable with the sacrifices required to afford your mortgage. You have factored in all of the initial costs of owning These costs include furniture, moving expenses, closing costs, etc. Regarding furniture, plan to spend around $5000-$10,000 per 1000 square feet of your home, depending on the cost of your personal taste. Opportunity cost: Opportunity cost refers to the value, or cost, of what you will miss out on by choosing, in this case, to buy or not to buy. If you rent, you are giving up the option of owning a valuable asset. If you buy, you are likely depleting your savings accounts to cover down payments, property taxes, etc. Debt: If at all possible, a buyer should put 20% of the purchase price towards a down payment. Doing so will ensure you get the best interest rate available and avoid paying Private Mortgage Insurance (PMI). PMI is an insurance policy homeowners who put less than 20% down must pay until the buyer has accrued 20% equity in the home. PMI is typically several hundred dollars a month. You should also try to eliminate, or pay down as much as possible, any other debts you have--car loans, credit card debt, student loan debt, etc. Lifestyle: how will buying a home affect your lifestyle. Generally speaking, buying a home is more expensive than renting. Are you willing to make the necessary sacrifices in your lifestyle choices to cover the difference? If not, you may not be ready to buy a home. Furthermore, how does buying a home fit into your life goals? Do you want to buy a home before getting married? How long do you plan to stay in your current job? Do you want the ability to move to a new city or state or do you plan to stay in your current geographical area regardless of job? Lastly, What are the potential tax implications of buying? Homes are often (but not always) good investments. You can rent out parts of your home to help cover monthly costs/expenses. You can do whatever you want to you home (renovations, remodeling, decorations, upgrades, etc.). Homeowners are typically eligible for certain tax benefits. There is no guarantee your home will appreciate in value (see the 2008 housing collapse, for example). Owning and maintaining a home is expensive. Maintenance costs include property taxes, insurance costs, potential lawyer fees, and covering the cost of anything that breaks or malfunctions. No equity - everything you pay in rent goes into your landlord’s pocket, plus all of the equity accrued while you live in the domicile. If you do not live in an area with rent control, your landlord can raise your monthly payments with little notice. With an uncertain housing market, you should never buy impulsively or if doing so places excessive strain on your personal finances, savings, or retirement contributions. Instead, plan ahead. Calculate exactly how much buying a home will cost--down payment, mortgage, taxes, insurance, moving costs, furnishing costs, etc.--and make sure you are comfortable with those dollar amounts. You can afford mortgage payments, without having to make excessive financial sacrifices. You have saved a 20% down payment. You have a steady job with reliable income and enough of a safety net to cover your monthly expenses for 3-6 months should you lose your job. Find a lender - look at different places and get pre-qualified for a mortgage. Be sure to do so with multiple lenders and compare the rates and fees to find your best option. With skyrocketing housing prices in places like San Francisco, New York and Los Angeles, many millennials cannot afford a 20% down payment, not to mention the maintenance costs associated with owning a home. Renting, therefore, affords younger people the ability to have more job and geographic flexibility in an economy where it is difficult to acquire and maintain high-paying jobs. According to Trulia’s 2016 Rent vs Buy report, (https://www.trulia.com/blog/trends/rentvsbuy_retirees_spring16/), buying a retirement home is roughly 40% less expensive than renting a retirement residence in all major metropolitan areas. Homeownership is something to which most people aspire. Buying a home is likely the biggest purchase you will ever make, but it will also be your most valuable asset. However, becoming a homeowner is a big deal and should not be done without careful consideration and calculation. For some, buying a home may not, at present, be the best option, regardless of their desire to do so. We hope this guide offers you the tools to determine whether or not the time is right for you to buy a home and if so, how to proceed in an informed manner. A Residential Lease is a legally binding agreement negotiated between landlord and the potential tenant. The lease includes address of the property, term of lease, tenant and landlord contact details, an inventory of fixtures and fittings and agreed terms of the lease. 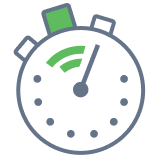 A month to month lease agreement is vital for commercial and residential property rental businesses. It guarantees landlords predictable, protected cash-flow. Tenants enjoy flexibility of avoiding a longer fixed term rental agreement. A rental application is used by landlords to screen potential renter. It documents the personal and financial information about the potential renter. The goal is to give the landlord enough information to determine whether or not they will allow the potential renter to live or otherwise use their property. A sub-lease agreement applies between a person who is renting a commercial or residential property and another person or organization. It establishes terms and conditions for both parties. They normally apply during a period of absence of the primary tenant.